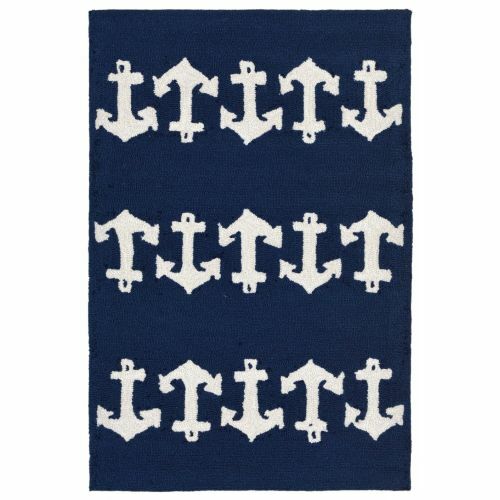 Trans Ocean Anchor Navy Rug 42" x 66"
Home :: Home Decor :: Coastal Area Rugs :: Indoor Outdoor Rugs :: Anchor Navy Rug 42" X 66"
Simple yet fashionable pattern lends itself well to the loosely tufted construction, while sophistication is achieved though intricately blended colors. Ideal for Indoor or Outdoor, these hand-hooked synthetic rugs are easy to clean and UV stabilized. The synthetic material and loop construction makes these rugs soft underfoot, yet durable enough for any high traffic area of your home.